Did you know that in the wild, parrots spend 70 percent of their time searching for, gathering, and working for their food? In our homes, as companion parrots, their food is presented to them in a bowl, leaving the whole day for them to find other things to do to occupy their time. Most of us parrot owners give our parrots toys, and some parrots play with them; some don’t. 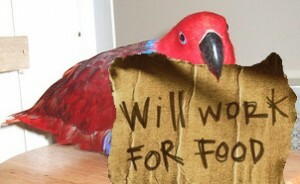 Since most pet parrots are not the result of thousands of years of domestication, like pet dogs and cats, but are instead only one or two generations removed from the wild, they still retain the strong instinct to forage for their food.